If you are planning a winter holiday or weekend break with your kids in the mountains, then be sure to visit us at our FUN PARK, the biggest of its kind in Slovakia and the second biggest in Europe. It is not only the kids who have come to learn to ski that will come into their own in the park but, also those that just want to have fun. Here in our amazing FUN PARK your kids will find loads of fun, games and competitions. The Kids FUN PARK in Mistr�ky, Donovaly is in the ideal place to learn how to ski � smack bang between the two ski slopes of Nov� Ho�a and Z�hradi�te. 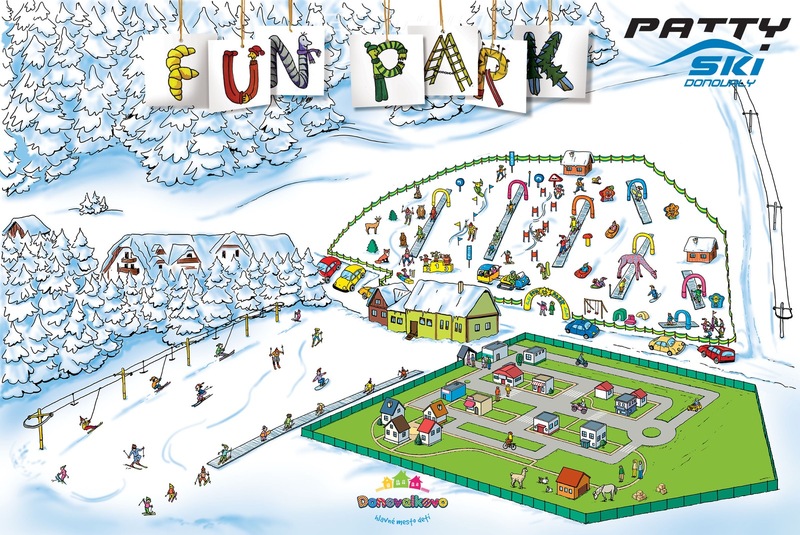 To the original area of 2,500 m2 FUN PARK by Patty Ski we added nearly 10.000 m2 more area in December 2011, which means it climbs right to the top of kids� parks and how they are equipped and makes it the second largest of its kind in Europe. The FUN PARK has 9 Sunkid moving walkways which allow kids to learn to ski much quicker and without being afraid and at the same time have great fun learning. There is also a motor-driven carousel that is a great help in learning to ski. Kids can enter the ski play school from the age of 3 and for those complete beginners the walkways are the best help out there. Every day at 12:00 a.m. we invite all kids and adults to our unique �Show on Snow� that has lots of games and fun and an unforgettable ride on our snow train. Our mascots Dodo, Lulu, Brum�k and the PARK SNOW mouse are all looking forward to having fun with you. Every kid from the Brum�k ski play school receives a great gift! Make your bookings and reservations at the reception in your hotel!